A hook can be used as a terminal device instead of the hand. Hooks are especially good for activities that demand precision for grasping small objects such as screws or nails. The hook is a reliable and robust tool which can keep up with the lifestyle of a child. Hooks are opened via a body harness worn on the upper body. They close independently by means of spring or elastic components. 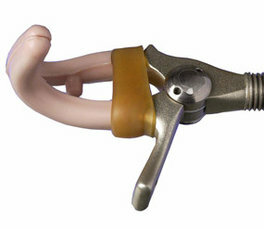 While not necessarily new, they remain a great, high-functioning upper-extremity prosthetic option.